We all have hang ups and insecurities. There are aspects of our lives that we feel uncomfortable with and the voices inside our heads take great delight in reminding us of our inadequacies. It’s time to hang up on your hang ups. It’s time to stop focusing on your negatives. You don’t have to allow your fears, your flaws or your weaknesses to hold you back any longer. Remind yourself of your past victories. Speak to yourself with kindness. Know that God has a plan for your life. Allow yourself to feel good about your future possibilities. 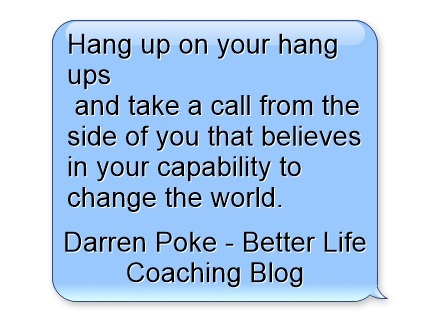 So hang up on your hang ups and take a call from the side of you that believes in your capability to change the world.